I've seen the film a dozen times and read the book twice now. This simple little story gave me the creeps as a kid. Ever since, I've had a fear of St. Bernard dogs. Cujo makes Beethoven look like a cute, furry creature. It has been said that with a mixture of drugs and alcohol, Stephen King remembers very little about actually writing this novel. Well, Mr. King, I think your best work came from when you were under the influence. 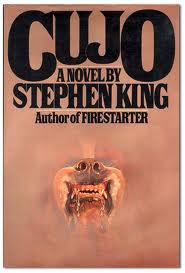 Cujo is the story of a St. Bernard who is infected with rabies after chasing a rabbit into a cave with rabid bats. Once the bats bite Cujo's nose he becomes infected and the onslaught starts. Mr. King does a fine job, when writing from the dogs point of view. He takes us into the mind of the animal as the disease slowly infects him. 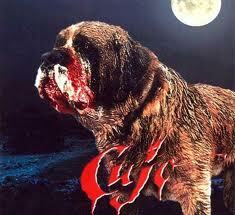 Once, a loving 180 pound dog, now turns into a killing machine, Cujo is one scary animal. After killing Gary (local drunk) and Cujo's owner, Joe Camber, Cujo hides out in the shade... waiting to strike. Every pound of him is now a murderous monster. Beyond the point of the story of Cujo lies another theme to the book. An adulterous marriage. Donna Trenton, whom fears getting older and living a mundane life, sets out to find some love on the side. Her lover, Steve Kemp, is a good looking tennis player and poet. After realizing that she has made the ultimate mistake and possibly ruining her marriage, Donna tries to break the relationship with Steve Kemp. When he is unsatisfied with her new look on life he writes a nasty note to Donna's husband, Vic Trenton. Now Donna's faithful, hardworking husband knows her dirty little secrets. Vic works for an advertising agency and has to go away for two weeks to save the Sharp account. The Sharp account is a brand of cereal that has been under some criticism for kids getting sick after eating the product. So Vic and his best friend and partner Roger head to Boston to reclaim the account. Meanwhile, Donna's pinto isn't running that good and she is informed to take her car to Joe Camber's garage. Little does she know, that Mr. Camber is dead and his family is away in Connecticut. When Donna drives her and her son Tad out to the garage the car dies and she is stranded there... with Cujo. For days Donna and her son, Tad fight for their lives as Cujo, with his infectious rage, literally turns their car into a prison. Donna must fight to keep her and her son alive. I loved this book. Possibly one of his finest works I've read so far. The story is simple and with the sub plots it makes for a great read. Stephen King does a fine job writing about a failing marriage hanging by the strings of love, faith and betrayal. It's also a story about the courage of a women in trouble with little to no hope for survival. The story bonds with each character and their circumstances. A very well written novel and a helluva story. The ending of the book is much more depressing than that of the film. In the film, Donna Trenton kills the beast and successfully resuscitates her son. There's your happy ending. However, with the book, King doesn't give you a happy ending. No, instead he gives you a bleak ending that suits well with the story. Little Tad does not make it and now the Trenton's have to face their ultimate fears. Through all the turmoil that they've endured; it's now time to start fresh; without their son. Ironically, the marriage is saved, yet the heartbreak of losing a child still lingers. If you're a Stephen King fan, you've probably read this book. If you haven't read the book, then I suggest you read it on my highest recommendation. It's a page turner and you'll appreciate it word by word.